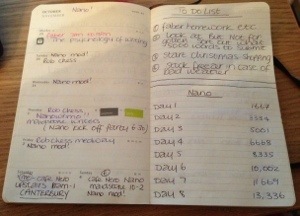 This entry was tagged Faber, Goals, Nano, To Do List, Writer, Writer Resources, Writers Resources, Writing, Writing Goals. Bookmark the permalink. Good luck with your goals. I’m Judy hoping to make it through the first few days of NaNo without crying. He he he, the Nano forums are brilliant aren’t they! Good luck with the Nano and your writing list! I think I just found the thief of the hours out my day 😉 I don’t know how you do it all! Ha ha ha, go you Bridget!!!!! Hi Vikki: We are new to your site, finding “Your View Outside” on C2C’s Blog. Enjoyed your post, “The To Do List…” You remind me of my daughter. She’s a big list maker. Be careful, I found her one day, making a list, with #3 stating, Make a new list for the day. (lol) We’ve only just learned about NaNoWriMo this year, and have toyed with the idea of joining our fellow writers in an all-month writing fest. Coarse, the thought of juggling our blog, cleaning our book, querying & planning Thanksgiving as well as beginning our Christmas Shopping now as well, makes our heads spin. Coarse, I think it’s already been decided for me, as I’ve noticed it was on my daughters to-do-list! Looking forward to your future posts and so happy to have found your blog! Good luck with the NaNoWriMo! And I’m sure whatever topic you pick, will be fantastic!! Yes, my head is spinning, just a little. This week I need to prep for NaNo. Been putting it off as I don’t want to get bored of it too soon. Eeks! NaNo really is this week. Gah. Okay, panic over. It will be fun, right? Take care in that snow storm. Here in Ontario, we are supposed to have remnants of hurricane Sandy this week. Yay for NaNoWriMo! Good luck!